In commemoration of the World Refugee Day, June 20, 2007, the United Nations High Commissioner for Refugees in conjunction with the Office of the Prime Minister, International Medical Corps and National Geographic society yesterday organised a photo exhibition for refugee children at the Uganda National Museum. The two hours occasion which attracted viewers from government ministries and NGO representatives, was aimed at celebrating the lives of refugees worldwide. 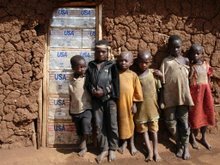 Celebrated two days earlier than the actual date, the photo exhibition dubbed ‘Through the Eyes of Children; Life as a Refugee in Uganda,’ was a culmination of a project started in November 2006 in Kyaka II refugee settlement-Kyenjojo district, where youth were trained in photojournalism. While representing their colleagues from the settlement Owizeye Joyce, 18, and Michel Nzimpa, 15, exuded hope for the future as they optimistically trusted the skills they attained in photo shooting. Prominent delegates at the function included the Minister for Disaster Preparedness and Refugees, Hon. Tarsis Kabwegyere, the Assistant High Commissioner for Operations (UNHCR Geneva) and many NGO representatives. A performance from the Burundian dance troupe climaxed the day’s event. 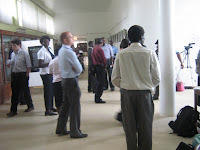 In the photo above, guests view the photos displayed by refugee children at the Uganda National Museum.